First half vs Villa and Second half vs Villa. You can probably come up with your own ideas on what it was like against a stubborn Villa side to show the contrast between the first and second halves. In the first half, we looked clueless as to how to break down their back 9 ( I swear there was hardly an inch between the likes of Vlaar – I’m sure he’s missing an extra consonant somewhere – and Delph sitting just in front of their back four), clearly missing a hold up target who could take a ball, hold it and pass in to an on rushing midfielder. In the second half, things improved immeasurably, with Pienaar surprisingly replacing Barkley, the one player who I thought had a chance of advancing on their packed defensive line, and eventually Naismith coming on, who knows a little better how to play up front than the permanently off side Mirallas. So a hard-won 3 points continues our quest for a CL place, and helped to heal the sores from last Tuesday, where something happened – can’t remember what it was, but something definitely happened. I am proud that we won yesterday, particularly so in the manner of the second half performance, when we not just changed personnel, but also the way we played with more movement and zip. In truth, Villa threatened very little, and it was left to the excellent Delph and Vlaar to stand out in their rearguard action. Why on earth they didn’t try to take more advantage of our reticence in the first 45 minutes only Lambert will know, but if I was one of their supporters, I’d be thinking they’d missed an opportunity. One corner all game, and that in stoppage time, tells its own story; and perhaps only 29% of the possession tells a slightly different story. Perhaps Villa could have been more threatening, but they rarely had the ball, and been when they did, they seemed fixated on lumping it up to a woeful Holt or just-as-woeful Benteke – the latter’s aerial threat nullified frequently by Barry jumping in front of him with Jags or Distin behind him. We nullified Holt’s threat by letting him have the ball, safe in the knowledge he’d kindly give it back to us in the next second. What was happening with Everton in the first half? The symptoms were slow ball, lack of movement, and the frequent offsides, of whom Mirallas was the worst but by no means sole offender. But the root causes were most probably the shaky confidence from whatever it was that happened last Tuesday, a reluctance to give the ball away given what a previous opposition did to us when we did. I’d add to the causes being that Barkley is clearly still not fit, neither is Pienaar, and frankly I doubt Jags and Distin are 100% either. McGeady just isn’t match fit either, hardly surprising when you haven’t played since November. Our injury list is improving, assuming Deulofeu is at least worth a cameo at Spurs, Coleman was on the bench so he may make it, Alcaraz will have had his obligatory ten day post match rest, and hopefully the week will see improvements with the aforementioned half fit players. One benefit of an injury list like ours, is that when they return, they will be less jaded than the likes of Lukaku has looked over recent weeks. Add to that a possible first start or sub performance from the towering Traore, assuming he doesn’t knock himself out on the tiny door frames at Finch Farm (I say ‘tiny’ only in his terms, normal height for most of us), and the squad is beginning to look strong again. We certainly didn’t know what to do when faced with 9 men behind the ball, so it was a relief when Naismith was introduced, and there’s a sentence I never thought I’d write. I really like Naismith, and I suspect I’m not alone, not just judged by the reaction of the crowd to his goal yesterday. In fact, it was more from the reaction to the goal he should have scored, when instead of aiming to either side, he planted a firm header right at Guzan. I honestly believe the Goodison faithful want Naismith to succeed more than many other players. We know he isn’t going to be a world-beater, we know he won’t get us 20 goals a season, but the Scottish-Messi tries like no other, and if only he had 10% more ability, or realistically 50% more self belief, I think he’d become a Goodison legend. And for the right reasons. His movement yesterday, even before his goal, shows that he knows what to do, and having him come on as a second half sub on left or right of midfield to shore up the side defensively, certainly isn’t playing to his strengths. I’d start him up top against Spurs, the lad can jump, he’s quicker than Dawson at least, and his movement could open up spaces for the likes of Mirallas, Pienaar and Barkley to advance in to. I thought Stones was hilarious yesterday, in a deeply patronising kind of way. It was painfully apparent last week that he can get in to the same space that Coleman can, but he can’t use it like Coleman can, and he can’t run back when he loses it like Coleman can. But, to his credit, we saw him high up the pitch again, but instead of always linking with McGeady, he also tried a few stepovers, that likened him less to the master Ronaldo (or Deulofeu) but more to a Giraffe on the Serengeti Plains. Good luck to the lad, I’m a huge fan, and I expect him to go on to captain our side and play for England. But at Centre Back, not Right Back. I felt so much more at ease when Hibbo came on towards the end, and that again is a sentence that at this stage of his career, I thought I’d never write again. Mirallas’ goal is worthy of a mention. I only know it was a goal because of the pandemonium around me, because the corner he meticulously picked out was the exact same corner of the goal I couldn’t see because of my friendly pillar. But what a strike. And Villa couldn’t defend it even though we’d given them an illustration of what he can do by printing a photo of a similar strike against Norwich in the match day programme. 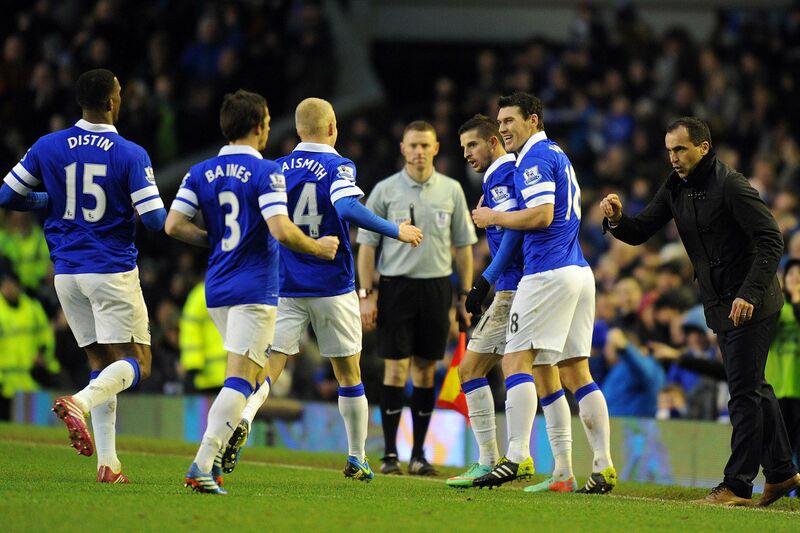 Baines was probably Man of The Match after all that. He was tireless up and down the park, did what little he had to do defensively pretty well, and linked up so well with Pienaar (there’s a surprise) when he came on for the last 45 minutes. I hope someone standing on his poorly toe/foot hasn’t knackered him again, but if so, step forward Luke Garbutt. As has been said before, Oviedo’s injury is dreadful, but it can mean an opportunity for another player, and maybe Garbutt is that player. It would be good to see. I expect him, Lundstram, maybe Duffy, McAleny and Green to be in and around the first team squad next season. By the way, hearing Oviedo Baby ring out towards the end was fantastic. Great supporters. As for now, off we go to White Hart Lane for what is a really good opportunity for us to win and put some more daylight between us and them, and even Man Utd (who continue to stutter). If we are faced with a tight back line like yesterday, which I doubt, then at least we know what to do about it. But I suspect Spurs will give us lots more space, and that’s something we certainly do know what to do with, as eventually Naismith showed yesterday.